If you have use jQuery Dialogify plugin for create popup modal dialog box with your PHP web application. Then in that application you have to perform any update data operation. So, this post will help you to how to integrate jQuery Dialogify plugin for update or edit data operation using PHP with Ajax. 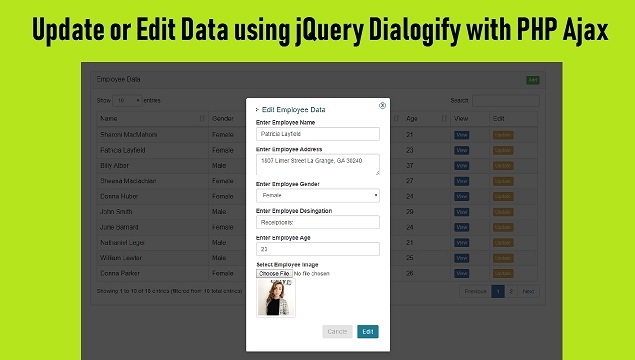 In previous part, we have seen how can we use jquery Dialogify plugin for Insert or Add data into Mysql data using PHP with Ajax. For this things here we have use jQuery based Dialogify library for popup modal on web page. Because it is very easy to use, and it is light weight and simple plugin. For make modal dialog box, by using this plugin we have to not write any HTML code. It will allowed users to write callback function call on any event. Here we want to update or edit data of existing mysql data using PHP script with Ajax. For load existing data into modal dialog box. If you have use this plugin, then you have to make seperate HTML form file for load data into form. Here for update or edit data, first we want to fetch existing data from database using Ajax request send to PHP. Once data has been received in json format, after this first we want to store that in Browser local storage using localStorage object, which store data with no any expiration date. Once all data has been store in browser local storage using localStorage.setItem() method. By using this method we can store data in browser local storage. After storing all data now we have to go to seperate file in which we have create HTML form fields, and in that file, we have to fetch data from browser local storage using localStorage.getItem() method. By using this method we can fetch data from browser local storage and store into local variable. After fetching all data, after this we have to assign that data to html form fields using jquery code. Lastly we have to use new Dialogify() method, and make popup dialog box using seperate file form fields with fill data. So, when we have click on update button, then modal dialog will popup with fill form data. Lastly, we have to trigger ajax reqest when use click on Edit button, which send ajax request to PHP script for update of data. This whole process code will you can find below. Here we have provide complete source code with View data in modal dialog box, insert data, update data and delete data using jQuery Dialogify plugin using PHP with Ajax. great , thank you sooo much . also need to add a check box in each row of the table and automatically save the value for this check box as 1 in the database when check it without page refresh ,, please help .